Freemium models are not all equal. Here’s what you should consider before you dismiss introducing a free plan for your business. Judging by the headlines, you’d think that the Freemium model in SaaS is at best a bad choice, and at worst, a suicidal move for your business. Overwhelming support costs: Free customers are going to be much more carefree about signing up for your product, and just as carefree when it comes to raising support tickets. In fact, the tendency to freely sign up without thinking too much about the fit or compatibility of the product could lead to a vast increase in support requests. The thing is, all of the above problems can be mitigated, with some careful planning and expectation setting. Set expectations for the level of support offered on your free plan. You don’t have to give the same level of priority to free customers as you do to paid accounts. But to avoid frustration, you need to be clear about what customers can expect before they sign up. Secondly, documentation is an incredibly cost-effective way to provide good, scalable support. It requires some upfront investment but the cost of scaling documentation to thousands (or even millions) of customers is zero! It really depends on the type and characteristics of the product. Know your incremental cost to add customers, and the current headroom for your platform. It shouldn’t really be a technical issue, but rather an economic issue. If you can’t technically add more customers to your platform (regardless of whether they’re paid or free) then you have some problems to solve. Run the numbers ahead of time. You should be able to model these changes and give at least a rough estimate of the impact. Despite the problems above, there’s a far more important distinction in Freemium plans: How you plan to move customers from the free plan to a paid one. This is the single most important aspect when designing a Freemium strategy that could make the difference between life and death further down the road. A soft-limited Freemium plan means that the customer can continue using the plan, usually for as long as they like. The plan is usually differentiated on features, so customers may only be using a ‘lite’ version of your full product, but it at least provides enough value to use it on an ongoing basis. Soft-limited Freemium relies on you nurturing free customers onto a paid plan. This might mean in-app reminders, email campaigns, or even an inside sales team focused on engaging with and converting said customers. There are multiple SaaS products that I use perpetually on a free plan. And this is the problem: I’m never likely to purchase the paid version of these products. By definition that makes me a BAD Freemium customer! As a B2B service, you don’t want these people. Note: This model can work if the product has some form of built-in referral loop, such that a free customer can help spread awareness and drive signups through use of the free plan. 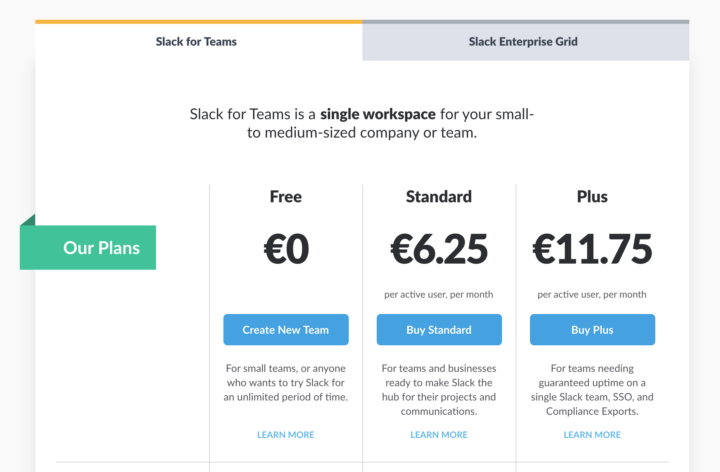 Slack’s free plan can technically be used forever. But it’s quite a “hard” soft limit, i.e. the free product becomes more and more limiting over time. Hard-limited Freemium plans may look similar to the customer, but they have one very important difference. There is a point in time for most free customers where they won’t be able to continue using the service on the free plan. This is because of a built-in limit in the design of the plan that essentially forces customers to upgrade. Hard-limited Freemium doesn’t require any of the nurturing that you need on a soft-limited plan. No in-app marketing, no email campaigns, no inside sales team focused on persuading customers to upgrade. It’s important to note that with these plans, not every customer will naturally hit the limit and upgrade. Of course, some people will always have just a few email subscribers. Some businesses are small and won’t hit the revenue limit. The important distinction here though, is that you have control over this. You can define the hard limit, and you can make that decision based on as much data and modelling as you like. You can even optimize this over time. This is something you just can’t do with a soft-limited Freemium model. Isn’t this just the same as an extended trial? In some ways, yes. We’re allowing people to try out the product for a period of time before they purchase. “Time” is another example of a variable you could use for a hard limit — and the one that’s used for most SaaS trials. What I’m arguing here is that “time” is a completely arbitrary variable to use, and it’s not very closely tied to the value customers get from the product. What you’re saying with a timed free trial is essentially “okay, after two weeks most people have realized the value of the product so they’re in a position to make a decision.” But in the case of more complex products (e.g. requiring some technical integration) that’s not always true. So why not use a variable other than “time” to base your hard limit? Something more directly tied to the product itself, and less arbitrary. It’s important to not consider all implementations of the Freemium model the same. Depending on how it’s designed and implemented, Freemium can unlock sustainable growth for many B2B SaaS businesses. BUT: You need to plan upfront. You need to run the numbers. And you need a pricing structure that suits your product.